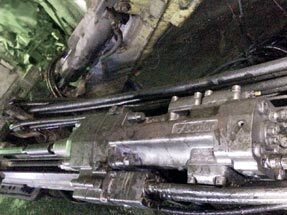 Doofor DF560L is a high-frequency hydraulic rock drill specially designed for underground production drilling and tunneling. The DF560L has a very low overhead, only 84mm from the drill center line. The rotation motor of the DF560L can be installed on the right hand or the left hand side. 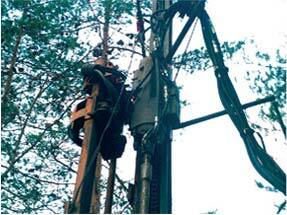 The rock drill has a separated flushing box. Flushing media can be water or air. Flushing parts are available in brass or in plastic to avoid corrosion caused by saline water. Optimal maximum hole diameter for the DF560L is 89mm [3 ½”] at the most. The rock drill can be equipped with shank adapters (striker bars) R38, T38, and T45. 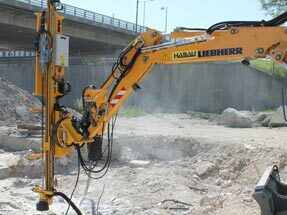 This rock drill can be equipped with stainless steel, separated flushing head for underground mining, bolting, and grouting. The DF560L can be equipped with heat resistant sealing for tap hole drilling. *) Numbers given are for standard rotation motor (160cm3) at an intermittent pressure of 175bar [2466psi]. Motor options are 80cm³, 100cm³, 125cm³, 160cm³, 200cm³, 250cm³. For professional use only as a component of a hydraulic system.